There are no hidden surcharges. Fuel is included in the price! The Four Winns Horizon 190RS runabout is all about luxury and quality. Features include a 220hp Mercruiser engine, bimini top, premium stereo, extended swim platform with reboarding ladder for lots of play space plus wakeboard tower, tilt steering, bolster seats, transom speakers and rear facing lounge seats. The Campion Allante 545i BR has bags of power for any towed watersport and plenty of space including an open bow. It has flip-up bolsters for driver/passenger, re-boarding ladder, walk-though lounge, and premium Kicker stereo. The Four Winns Horizon 180SS is performance, fun, and luxury in a compact package. 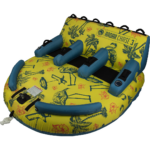 It sports wakeboard tower with board rack, bimini, Sony stereo with subwoofer, flip-up bolsters for driver/passenger, re-boarding ladder, walk-though lounge, and room for seven. Our Manitou Oasis SR is as good as it gets when it comes to quality, fit and finish. Manitou is to pontoon boats what Nautique is to towboats. Loaded with loungers everywhere, two bimini tops, tow bar, Polk Audio stereo with transom remote and subwoofer and a 300 horsepower engine; this Oasis SR is the ultimate combination of power and luxury in our pontoon fleet. Our Manitou Aurora LE VP is 24′ of performance and fun. It comes with a 150hp Evinrude engine by BRP, bimini, tow bar, two massive lounge areas fore and aft with table plus two captain’s chairs and Manitou’s exclusive centre “V-toon” which makes it handle like a traditional boat. 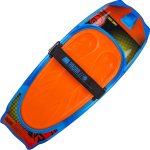 It has more than enough power to haul the crew plus a wakeboarder, skier, or tube. The following add-ons are available with boat rentals when booking on-line or just let us know when you book by phone. Single Tube for $10/hour with any boat rental. 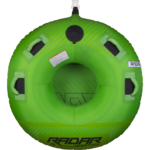 Three Person Tube for $20/hour with any boat rental. Kneeboard for $15/hour with any boat rental. 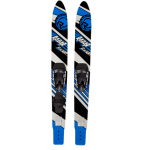 Combo Skis for $15/hour with any boat rental. Wakeboard for $20/hour with any boat rental.